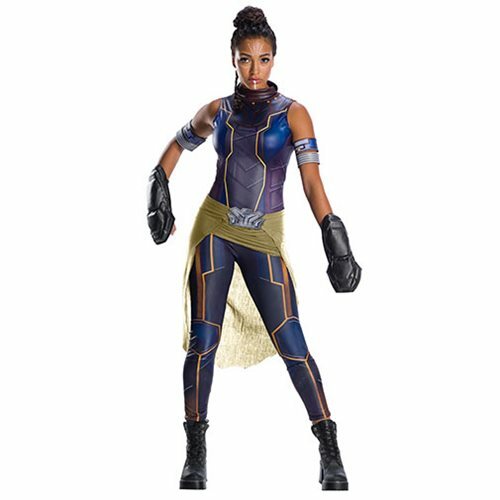 You might be able to "take Wakanda to a new place" as T'Challa's sister and the princess of Wakanda if you don this Black Panther Shuri Deluxe Costume based on the 2018 Black Panther film. Give it a try! Includes top, pants with shoe covers, 2x armbands, 2x molded knuckle busters. Available in X-Small, Small, Medium, and Large sizes. Bust 32"- 34" 33"- 35" 36"- 38" 38"- 40"
Waist 22" - 24" 25" - 26" 27" - 30" 31" - 34"